Political economy originally was the term for studying production, buying, and selling, and their relations with law, custom, and government, as well as with the distribution of national income and wealth, including through the budget process. Political economy originated in moral philosophy. It developed in the 18th century as the study of the economies of states, polities, hence political economy. In the late nineteenth century, the term ‘economics’ came to replace ‘political economy’, coinciding with publication of an influential textbook by Alfred Marshall in 1890 Earlier, William Stanley Jevons, a proponent of mathematical methods applied to the subject, advocated ‘economics’ for brevity and with the hope of the term becoming “the recognised name of a science. Today, political economy, where it is not used as a synonym for economics, may refer to very different things, including Marxian analysis, applied public-choice approaches emanating from the Chicago school and the Virginia School, or simply the advice given by economists to the government or public on general economic policy or on specific proposals. A rapidly-growing mainstream literature from the 1970s has expanded beyond the model of economic policy in which planners maximize utility of a representative individual toward examining how political forces affect the choice of policies, especially as to distributional conflicts and political institutions. It is available as an area of study in certain colleges and universities. Comments Off on Circus Politics: Will Our Freedoms Survive Another Presidential Election? Memo to the Fed: you are the enemy of the middle class, capitalism and the nation. The Federal Reserve is appalled that we’re not spending enough to further inflate the value of its corporate and banking cronies. In the Fed’s eyes, your reason for being is to channel whatever income you have to the Fed’s private-sector cronies–banks and corporations. If you’re being “stingy” and actually conserving some of your income for savings and investment, you are Public Enemy #1 to the Fed. Your financial security is nothing compared to the need of banks and corporations to earn even more obscene profits. According to the Fed, all our problems stem from not funneling enough money to the Fed’s private-sector cronies. Fed media tool Jon Hilsenrath recently gave voice to the Fed’s obsessive concern for its cronies’ profits, and received a rebuke from the middle class he chastised as “stingy.” Hilsenrath Confused Midde-Class “Responded Strongly” To “Offensive” Question Why It Isn’t Spending. Memo to the Fed and its media tool Hilsenrath: we’re not here to further enrich your already obscenely rich banker and corporate cronies by buying overpriced goods and services we don’t need. Our job is not to spend every cent we earn on interest to banks and mostly-garbage corporate goods and services. Our job is to limit the amount we squander on interest and needless spending. Our job is to build the financial security of our families by saving capital and prudently investing it in assets we control (as opposed to letting Wall Street control our assets parked in equity and bond funds). Your zero-interest rate policy (ZIRP) has gutted our ability to build capital safely. For that alone, you are an enemy of the middle class. Let’s say we wanted to buy a real asset that we control, for example, a rental house, rather than gamble our retirement funds on Wall Street’s Scam du Jour (stock buybacks funded by debt, to name the latest and greatest scam). Thanks to your policies of ZIRP and unlimited liquidity for financiers, we’ve been outbid by the Wall Street/private-equity crowd–your cronies and pals. They pay almost nothing for their money and they don’t need a down payment, while we’re paying 4.5% on mortgages and need 30% down payment for a non-owner occupied home. Who wins that bidding process? Those with 100% financing at near-zero rates. 1. New house: overpriced. Debt-serfdom for a wafer-board/sawdust-and-glue mansion? Pay your banker buddies $250,000 in interest to buy a $300,000 house? Hope the bursting of the real estate bubble doesn’t wipe out whatever equity we might have? No thanks. 2. New vehicle: overpriced. We can buy a good used car and a can of “new car smell” for half the price, or abandon car ownership entirely if we live in a city with peer-to-peer transport services. We can bicycle or ride a motorscooter. 3. Anything paid with credit cards. 5. A subscription to the Wall Street Journal and other financial-media cheerleaders for you, your banker buddies and Corporate America. 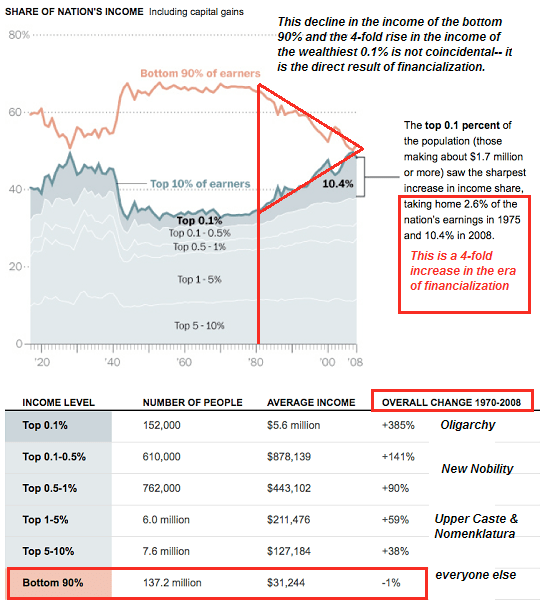 And here’s how the middle class has fared since the Federal Reserve made boosting Wall Street and the too big to fail banks its primary goal, circa 1982: the bottom 90% have treaded water for decades, the top 9% did well and the top 1% reaped fabulous gains as a result of your policies. If you’re wondering why we’re not spending, look at our incomes (going nowhere), earnings on savings (essentially zero) and the future you’ve created: ever-widening income disparity, ever-greater financial insecurity, ever-higher risks for those forced to gamble in your rigged casino, and a political/financial system firmly in the hands of your ever-wealthier cronies. Capital–which includes savings–is the foundation of capitalism. 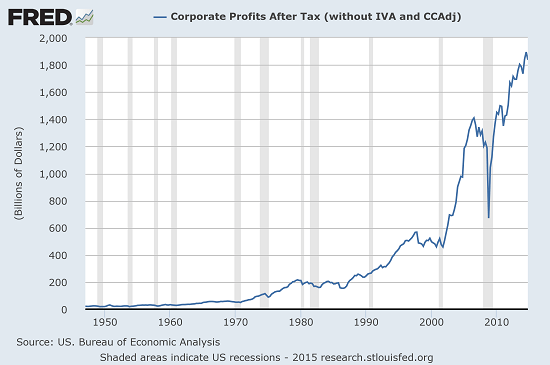 If you attack savings as the scourge limiting corporate profits, you are attacking capitalism and upward mobility. The Fed is not supporting capitalism; rather, the Fed’s raison d’etre is crony-capitalism, in which insiders and financiers get essentially free money from the Fed in unlimited quantities that they then use to buy up all the productive assets. Everyone else–the bottom 99.5%–is relegated to consumer: you are not supposed to accumulate productive capital, you are supposed to spend every penny you earn on interest paid to banks and buying goods and services that further boost corporate profits. 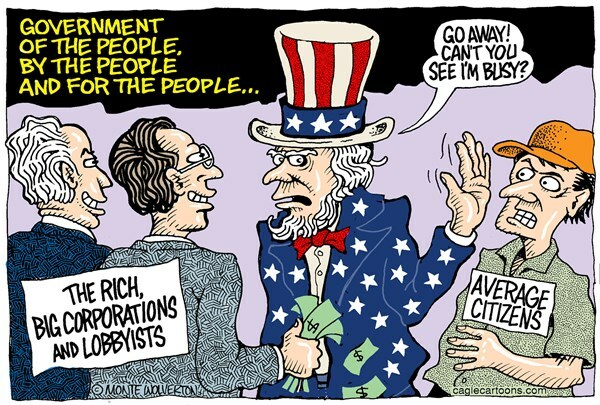 This inversion of capitalism is not just destructive to the nation–it is evil. Funneling trillions of dollars in free money for financiers while chiding Americans for not going deeper into debt is evil. Memo to the Fed: you are the enemy of capitalism, the middle class and the nation. Some time between the middle and the end of October, the federal government will reach a hard limit on the amount of debt it can issue, and its ability to finance governmental operations will be affected. Confusion about the debt limit abounds, and this Issue Brief will address some common questions. What Is the Debt Limit? The United States debt limit, or debt ceiling, is the statutorily defined amount of debt the U.S. Treasury can issue, either by borrowing from the public or issuing an intragovernmental receipt to special accounts, such as the Social Security or Medicare trust funds. The Treasury Department has to have liquidity, or cash on hand, to disburse the funds necessary to meet its contractual obligations. The federal government maintains this liquidity by managing governmental receipts (such as income tax payments) and selling debt (such as Treasury bonds). Will a Government Shutdown Occur If the Debt Limit Is Not Raised? The debt limit is often confused with the expiration of appropriations bills. Reaching the debt limit is distinct from a government shutdown. A government shutdown occurs when appropriations authorization expires: Unless there is a law saying that money may be spent on a project, money may not be spent on that project. A debate over an appropriations bill is a debate over whether to fund a specific government function. When the government shutdown began, only certain statutorily defined “essential” government functions have continued to operate. The debate over the debt limit, however, is a debate over how to finance governmental operations—reaching the debt limit would not force a government shutdown. Currently, the debt limit is $16.699 trillion. The federal government reached this limit on May 19, 2013, and Treasury has since used statutorily allowed “extraordinary measures” to avoid issuing additional debt and still have the cash on hand to finance day-to-day operations. When the Treasury exhausts these extraordinary measures, the federal government will continue operating. However, the President might decide that federal employees, for example, will not necessarily be issued checks available to cash immediately. Even without the ability to issue additional debt, the government will continue to accrue legal obligations; it will simply not be able to immediately liquidate (pay cash for) those obligations. What Happens to the U.S. Debt If We Reach the Debt Limit? It is impossible to tell what would happen if the debt limit is not raised. If Congress and the President are unable to reach an agreement on raising the debt ceiling, markets and credit rating agencies might interpret this negatively as unwillingness of the U.S. government to honor its obligation. If the President chooses to default on all obligations rather than a few (discussed below), this could exacerbate the problem. Market perception of U.S. sovereign debt directly affects bond yields (interest rate paid) on U.S. debt, so decisions the President makes can actually save or cost the government money in the long term. The Prompt Payment Act provides that the “temporary unavailability of funds to make a timely payment” does not excuse delayed payment and that the government is responsible for paying interest charges on such delayed payments. Over time, these interest penalties capitalize, so the federal government ends up paying compound interest. Depending on how the President manages payments, statutory interest payments may be greater or smaller. What Would the President Prioritize? While there have been proposals to cabin the authority of the executive to prioritize payments, as it stands there is no statute governing how to manage government finances past the debt limit. Since governmental obligations would exceed receipts, exceeding the debt limit logically implies that at least some obligations would be delayed. These obligations would thus, by definition, be in default. There is no general “governmental default” past the debt limit; default would occur with respect to specific obligations that the President chooses not to prioritize. There are constitutional backstops on the President’s otherwise plenary authority to prioritize payments. Of these, the most important is that the President may not prioritize payment in violation of the Due Process Clause of the Fifteenth Amendment. He may not, for example, choose to pay the salaries of federal employees of one race before paying the salaries of federal employees of another race. Subject to this limitation, the President’s prioritization choices are essentially unbounded. The President could, of course, play a game of political brinksmanship and fail to pay any obligations until the debt ceiling is raised. He could argue that all obligations are on an equal footing and that prioritizing payments violates some principle of fairness. Former Treasury Secretary Timothy Geithner made statements about the political unworkability of prioritization in the past, but to date, Treasury has not disavowed its legal authority in this area. Failing to prioritize debt obligations would have far-reaching consequences, however, including potentially increasing the cost of servicing the debt long after the debt limit crisis ends. Further, to the extent that this situation would involve having cash on hand and failing to pay some receipts, this option implicates the Congressional Budget and Impoundment Act of 1974, which prevents the President from deferring any “budget authority.” This phrase is defined to include “borrowing authority, which means authority granted to a federal entity to borrow and obligate and expend the borrowed funds.” Holding cash until such time that the Treasury can meet all of its payments necessarily includes deferring expenditures of borrowed funds until such time as the debt ceiling is raised, which would implicate these statutory limitations. The President could also choose to continue payments for “essential” services analogous to those defined in the appropriations context. There is no statutory requirement for this decision, but the idea that there are “core” functions of the federal government that ought to remain liquid is easily understandable. Meeting debt obligations and paying military personnel might be prioritized at the expense of other obligations, such as issuing certain grants and loans to private-sector firms and to state and local governments, for example. So-called mandatory spending, such as Social Security payments, do continue during a government shutdown, but they need not be prioritized at the debt limit. The President could also pick and choose among programs he likes and those he does not like. He might direct Treasury to pay Department of Defense employees before Department of Education employees, or vice versa. Whatever decision he makes would be essentially unchallengable in court. Ultimately, however the President chooses to manage payments, delays will accumulate and worsen until either spending is cut or the debt ceiling is raised. In brief, the President has broad authority to manage government payments to avoid defaulting on federal obligations. He can choose which payments to make and in which order, and these choices will impact the effects on the average U.S. taxpayer and the economy. —Andrew Kloster is a Legal Fellow in the Edwin Meese III Center for Legal and Judicial Studies at The Heritage Foundation.